In Gettysburg, a battle raged through this small south-central Pennsylvania town. Confederate and Union soldiers experienced monumental struggles and acts of great courage–acts that helped create our country's identity. Today, Gettysburg encourages visitors to walk the fields where these soldiers fought and died to find their own place in history. Every soldier, monument, exhibit and landmark tells a different story that affects each visitor in a unique way. 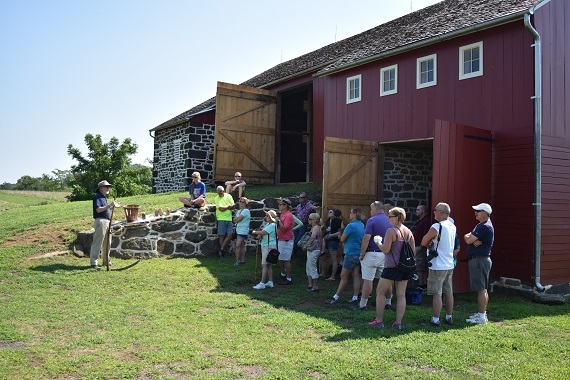 We invite you to explore all that Gettysburg has to offer–from the Film, Cyclorama & Museum Experience at the Gettysburg National Military Park Museum & Visitor Center, to Licensed Battlefield Guided tours of the battlefield and our numerous historic sites in and around the town of Gettysburg. Endless inspiration awaits you. 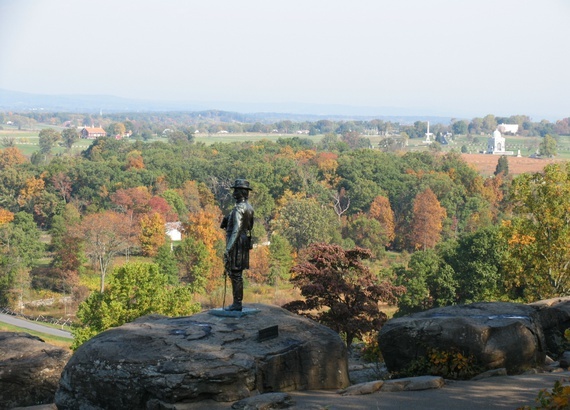 What makes Gettysburg such a special place? The series of videos below, presented by David Hartman, delve into why Gettysburg continues to fascinate and help visitors connect to a vital time in our shared history. 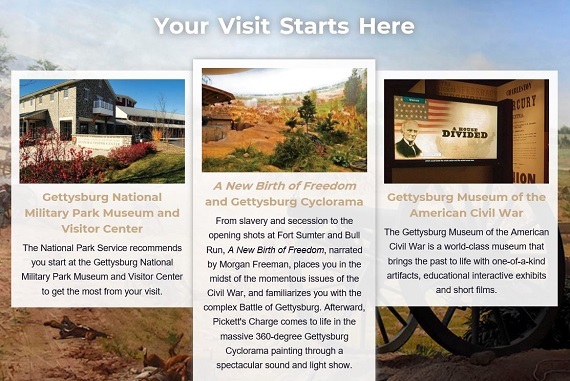 Start your visit to Gettysburg at the Gettysburg National Military Park Museum & Visitor Center - the official site of the National Park Service and the offical start to your visit, located at 1195 Baltimore Pike, just south of historic Gettysburg. The Museum & Visitor Center is the best place to learn about the sacrifices made during the Battle of Gettysburg, the causes and consequences of the American Civil War and the lessons of citizenship, leadership, conflict and conciliation in American democracy that remain timeless and relevant to our lives today. Make the most of your visit by experiencing all that the Museum & Visitor Center has to offer. At Gettysburg National Military Park, tours on the battlefield have been popular for more than a century. Today, there are several ways to experience the 7,000-acre battlefield: by bus or car with a Licensed Battlefield Guide, using the auto CD tour (available for purchase in the Museum Bookstore) or following the self-guided auto tour of the park's official road map and guide. Purchase tickets at the Gettysburg National Military Park Museum & Visitor Center to several historic sites, including the George Spangler Farm & Field Hospital, Eisenhower National Historic Site and the David Wills House. Be sure to also visit the Gettysburg Lincoln Railroad Station, the Rupp House History Center and the Soldiers' National Cemetery during your visit to Gettysburg. Whether you have two hours or three days, numerous experiences await you. 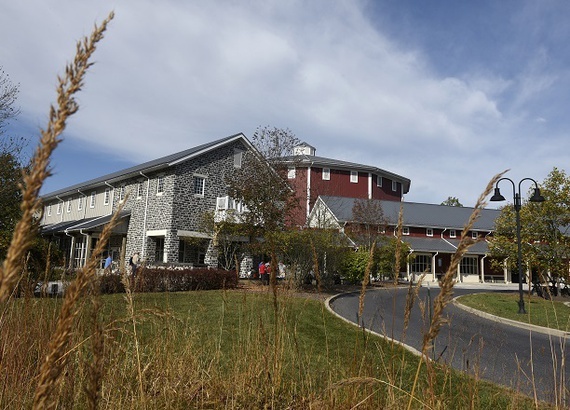 The Gettysburg National Military Park Museum & Visitor Center welcomes groups. 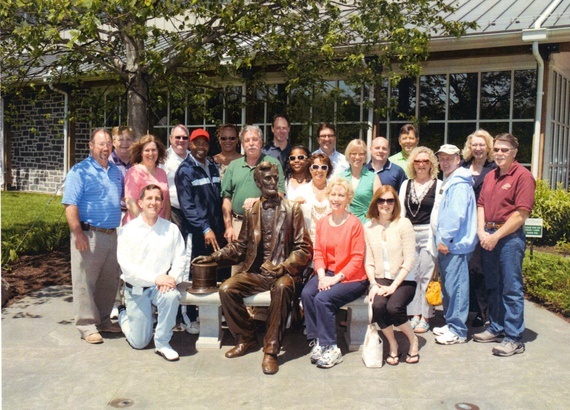 If you are visiting Gettysburg with a group of 16 or more, find out about special group amenities, rates, programs and experiences.